Although we primarily use birch, maple, and oak in the manufacture of cabinet doors, we are fully prepared to work with any other species if so required. Meeting your needs and expectations is our top priority. 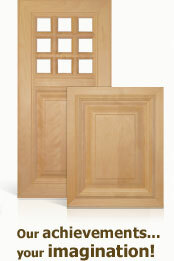 Excelbois offers a wide selection of door models. We offer products with a unique flavour, crafted according to the taste and needs of the client - the only limit is your imagination. Browse the complete catalogue (PDF) "
Contact us for more information on our rates "